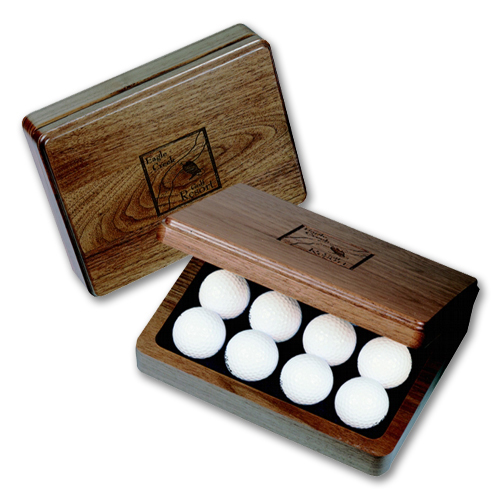 This solid wood box will hold a full dozen golf balls. The solid brass hinges are concealed for a smooth exterior and the large lid offers more than ample space to deliver your best shot. This solid hardwood hinged lid box is a golfer's dream come true. Many golfers will use this box as a collector for those special golf balls. The die-cut blue, navy blue or black insert holds 12 balls in place and makes a beautiful display. The removable insert will allow this box to be a storage box if preferred. The recipient is the real winner here. Golf balls are not included, however we will insert your provided golf balls at no additional charge! Shown is the golf ball box in walnut with black flocking. 9" x 7" x 2 1/4"
Laser Area: 4" x 4".